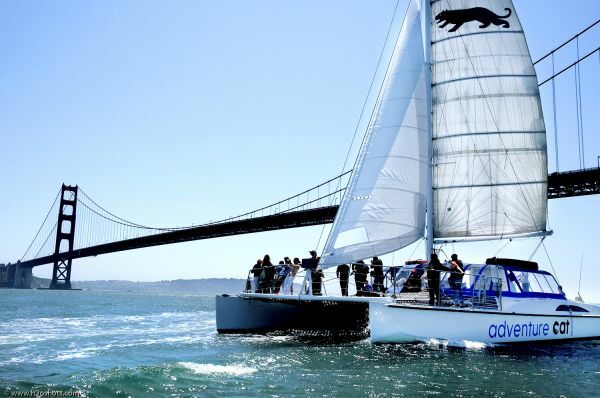 ACsailingSF has something special for those with a craving for speed, adrenaline and the latest America’s Cup technology: sign up for a ride on the 85-foot, 20 passenger USA 76 Challenger from the 2003 America’s Cup. Visitors have the opportunity to sail on a former America’s Cup racing yacht: USA 76 was previously owned and raced by ORACLE Racing in their challenge for the 2003 America’s Cup in Auckland, New Zealand. Public sailing on the San Francisco Bay and charters for corporate events are available now. Hours of Operation: Tuesday - Sunday 9:00am-6:00pm. Come share in the adventure of a 1 ½ hour sail on beautiful San Francisco Bay. Sail by Alcatraz Island, under the Golden Gate Bridge and look for sea lions, then cruise down the city skyline. The ADVENTURE CAT is a 55’ Catamaran for up to 48 passengers, and the ADVENTURE CAT II is a luxury Catamaran for up to 99 passengers. Both are U.S. Coast Guard Certified Sailing Vessels. Cross Streets: Beach Street and the Embarcadero. Directions: Parking is available in the PIER 39 garage. Please visit our website for a current cruise schedule. Step aboard the 28′ RIB (Rigid Inflatable Boat) and get ready for a ride on the bay unlike any you have ever experienced! After you’re outfitted with foul weather gear (to keep you warm and dry from the occasional splash), Bay Voyager takes you around the bay to take in some of its most famous sights. This small-group tour is limited to 12 people per tour to ensure a more personalized experience. Each tour is narrated by a captain. Private charters available. The Blue and Gold Fleet is the premier ferry service provider on San Francisco Bay. Services include: a one-hour narrated "San Francisco Bay Cruise Adventure" along the city's historic waterfront; “Escape from the Rock Cruise”, a 90-minute tour “fully-loaded” with chilling accounts of harrowing escape attempts by Alcatraz’s notorious criminals as well as their descriptions of the brutality of life on the island; Rocket-boat, a 30-minute thrill ride on the bay not to be missed; leisure and commute ferry services to Sausalito, Tiburon, Angel Island, Oakland, Alameda, and Vallejo. 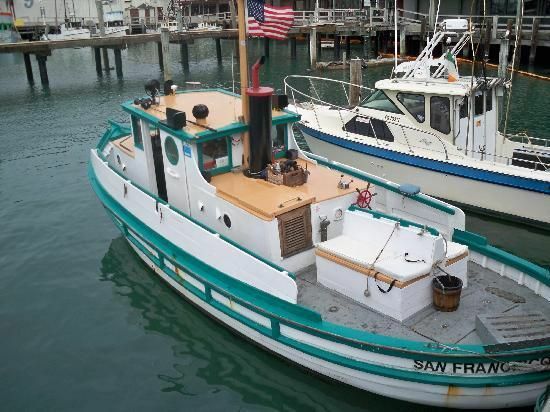 Enjoy San Francisco Bay tours and charters aboard Dixie, the DiMaggio family's 1924 Monterrey Clipper fishing boat. Dixie is an original Fisherman's Wharf California Historic Vessel, powered by an original 2cyl Hicks engine. Full-service charters. 6 passengers max. Cross Streets: Jones and Jefferson Streets Directions: The Marina at Jones and Jefferson Streets is convenient to Fisherman's Wharf parking lots and public transit. For more information, please visit the Parking or Public Transit pages. The Lovely Martha is a first class, seaworthy oceangoing cabin cruiser. Each season we offer open load charter boat fishing. Her passenger capacity is 49, and maximum number of fisherman is 35 for mooching (drift fishing) and 25 while trolling. Charters are available year-round for all fishing needs or special events. We also feature fully narrated one-hour SF Bay sightseeing tours. Available for private parties on the bay, whale watching, special events, and funerals at sea. "Miss Farallones" with Captain Ted Varena. Captain Varena started as a deckhand at the age of 16. He received his Captain's license in 1976 and became a skipper for Hank Schramm Sportfishing in Emeryville. In 1980, he started on the Miss Farallones. His wife, Ellen, is one of the nicest deck hands to fish with in the entire Bay Area. 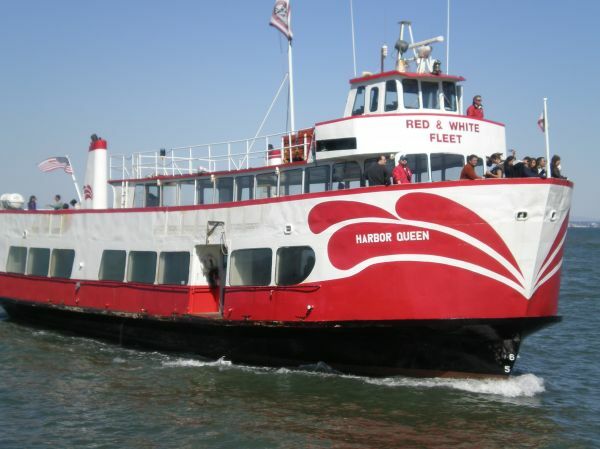 Founded in 1892, the family-owned Red and White Fleet is legendary for its exciting San Francisco Cruises™. The company is committed to environmental sustainability, supporting community education, the preservation of San Francisco’s unique history – and offering a fun and spectacular experience to visitors from around the world. Sail aboard the 1-hour Golden Gate Bay Cruise under the Golden Gate and around Alcatraz – San Francisco’s only cruise in 12 languages. Discover San Francisco’s unique Natural History, Architecture, and Native American Culture aboard the 90-minute SF Explorer Cruise. Or, enjoy spectacular sunset views and a hearty appetizer buffet by Boudin in a relaxed twilight atmosphere on the 2-hour California Sunset Cruise. Join San Francisco Whale Tours aboard their 65-foot eco-friendly catamaran, the Kitty Kat, and venture into the Gulf of the Farallones National Marine Sanctuary in search of the largest marine species on Earth. Their expert naturalists teach you all you need to know about marine life as you scan the horizon for whales, dolphins, sea turtles, sharks and many other marine species. No whale sightings on your tour? The next trip is complimentary. Not sure about a day on the open ocean? The San Francisco Whale Tours’ Eco-Tour offers a chance to learn about the natural history and wildlife of the San Francisco Bay while experiencing breath-taking views of the City, the Golden Gate Bridge, Alcatraz and more! A-Dock Advance purchase required. Tours usually sell out! SF Bay Whale Watching provides whale watching natural history expeditions from San Francisco Bay to the Gulf of the Farallones National Marine Sanctuary. The full day excursion unfolds as you pass underneath the Golden Gate Bridge, cruise by the 1877 Point Bonita Light House, then head out 27 miles toward the Farallon Islands. The Silver Fox originated as a classic party boat serving both San Francisco and Berkeley. The vessel has a stable steel hull for a smooth and comfortable ride, and has been completely refurbished with the latest electronics and most advanced John Deere engines for improved speed and safety on the fishing grounds. The Silver Fox will be offering specialized charters and an open boat for fishing, potluck on the Bay, as well as Albacore trips and sturgeon fishing in the winter. The Silver Fox is also available for special occasions for sightseeing tours, whale watching, great white shark adventures at the Farallon Islands, corporate events, and sea burials. Captain Jacky Douglas is a female skipper who has been guiding fishermen to salmon and all Bay Area sport fish for over thirty years. Jackie started fishing on SF area boats in 1955, and became a deckhand in 1970 on the New Flory S. She skippered a private boat and fished commercially for several years. She became the skipper of the Wacky Jacky in 1973. Jacky is well known for taking good care of her customers, and says the most important thing is "to have my customers leave with a smile on their face." Experience California Wine Country during your Wine Therapy bay cruise. Take a cruise aboard San Francisco’s only floating wine tasting room. You will enjoy a wine country experience as our wine steward walks you through a flight(5 tastings) of wonderful Northern California wines, all while taking in the exquisite San Francisco sights on a 2-hour daytime or sunset bay cruise aboard the 1958 classic vessel, “Wine Therapy”. Whether you like reds, whites or sweet wines, Wine Tasting on the Bay will cater to your tastes. They have a full bar too and additional drinks are available for purchase after your tastings are finished. A cocktail or beer may be substituted for the wines. Wine Therapy can comfortably hold up to thirty people. All aboard for good wine, good company and a great time!